Small print in the ad cites an April 7 story in Forbes, which is about a survey of 148 insurance brokers taken by Morgan Stanley to help guide investor decisions about stock purchases. A state-by-state chart suggests a 35.6 percent increase in rates in the individual market in Michigan in 2014, according to responses from just six insurance brokers in the state. Robert Santos, senior methodologist at the Urban Institute and past president of the executive council at the American Association for Public Opinion Research, told us that the survey has no scientific validity with regard to the aggregated nationwide results. He also said that “anyone would be on very tenuous ground in trying to make a state-specific inference” from the survey. A small notation below the state chart uses technical jargon to warn the same thing. And even if the figure were accurate, it doesn’t account for improved coverage or government subsidies, which 80 percent of those in the new individual market exchanges are expected to receive. Full story: “AFP Misuses Survey Again,” May 30. Claim: A Michigan family’s “new plan is not affordable at all” under the ACA. Facts: Another Americans for Prosperity ad features a Michigan mom, Shannon Wendt, who says her family’s “new plan is not affordable at all.” Her case is actually an example of how middle-class families can benefit from the health care law — if they choose to do so. The ad leaves the false impression that the Wendt family obtained its costly new insurance plan through the federal exchange set up by the ACA. Rather, the family’s “new plan” is a temporary plan that does not meet the ACA requirements. Blue Cross Blue Shield of Michigan offered the plan to customers who had their old policies canceled but did not want to purchase insurance on the exchange. It turns out that Wendt found a cheaper, subsidized plan on the exchange, but declined to accept it because she did not want her children on the Children’s Health Insurance Program, even though they were eligible. HealthCare.gov explains that a family cannot receive subsidies to help buy insurance on the exchange if the children in the family are CHIP-eligible and they do not sign up. We found that a Michigan family of seven similar to the Wendts could get a “silver” plan with the same coinsurance as the Wendts’ current plan, a monthly premium that would be roughly the same and an annual deductible far below their current $10,000 deductible. Plus, such a family would be eligible for subsidies to reduce out-of-pocket expenses to around $3,000 — which could represent a significant savings since Shannon Wendt told MLive.com, a Michigan news website, that her family paid $10,000 in out-of-pocket expenses last year. Instead, Ryan’s plan, which he first included in his 2011 House budget, called for a transition to a premium-support system in which people currently under 55, once eligible for Medicare, would get government subsidies for a selection of insurance plans on a Medicare exchange. The private plans offered would have to include minimum benefits equivalent to those covered by traditional Medicare. The 2011 version of Ryan’s plan didn’t include traditional Medicare as an option on that exchange, but his plan the subsequent year, and every year since, has. His proposals also have grown increasingly more generous in terms of how that premium-support subsidy increases over time. Land expressed support for the 2012 Republican Platform, which among other things called for a premium-support system like Ryan’s plan. 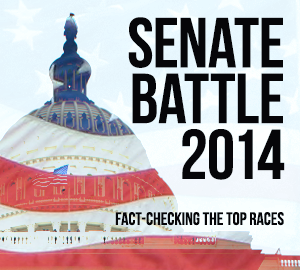 Democrats have made similar claims against Republicans in many congressional races. Facts: Ending Spending Action Fund made this distorted claim, wrongly implying that the outsourcing cost Michigan jobs, and blaming Peters for an out-of-state contract in place before he became lottery commissioner. The ad cites a 2005 article from the Detroit News about the state purchasing 6 million pencils for the lottery from a Chinese manufacturer for $210,000. According to the state’s purchasing director, Sean Carlson, no Michigan jobs were lost because no state-based company bid on the contract or even made such pencils at the time. The contract actually saved taxpayers $90,000. The ad also cites a Feb. 12, 2007, article in the Coldwater Daily Reporter that discussed the Michigan Lottery’s contracts with GTECH, a Rhode Island lottery operating company that Bloomberg News described as “the world’s biggest supplier of lottery systems.” GTECH has been the state’s lottery operator since 1988, so the company already held the contract when then-Gov. Jennifer Granholm appointed Peters commissioner on April 9, 2003. In June 2003, after Peters was appointed commissioner, the Michigan Lottery exercised an option to extend GTECH’s contract through 2009. No Michigan jobs were at stake because no Michigan companies competed for this highly specialized work. Facts: Peters didn’t support a carbon tax. Rather, he supported cap-and-trade legislation that independent analyses said would cause a small reduction in employment. The Land ad cites Peters’ vote for H.R. 2454, also known as the Waxman-Markey cap-and-trade bill, which would have required polluters to have allowances, or permits, in order to emit carbon dioxide. The bill passed the House in 2009 but died in the Senate. A carbon tax, while having a similar goal to cap-and-trade (reducing emissions), would instead be a direct tax on the carbon content of oil, gas and coal. Such a tax is politically unpopular, and legislation that would institute it hasn’t moved out of committee. The 96,000-jobs figure used by the Land campaign comes from a 2013 National Association of Manufacturers analysis of two hypothetical carbon tax proposals, not Waxman-Markey. We looked at Waxman-Markey back in 2009 and determined that the bill would have caused a loss of jobs, but opponents — including the NAM— were exaggerating the likely impact. Independent experts and the nonpartisan Congressional Budget Office said the cap-and-trade legislation could have led to a small loss of jobs.